The joy and challenge of building ‘cheap and cheerful’ sensors has a wide appeal to adults as well as children. It also opens a wide number of links to aspects of the maths, science, computing, design and technology, and engineering curricula, supporting scientific investigation and discovery. In 2016, the Technology Volunteers leaders designed and built an add on board for Arduino, the ExperiSense - to support a greater range of scientific experiments than was possible using the Picoboard, and also to enable output from Scratch into the physical world. In the table below are a set of worksheets to build and calibrate sensors for the Scratch Sensor Board (Picoboard). They are part of the resources supporting the Sensing Our World workshop, for the Scratch@MIT Conference, Create Your World, in July 2012. The workshop presentation is here. These workshops are used in local schools by the Technology Volunteers, a Warwick Volunteers project. Additional worksheets have been developed for the Scratch 2013 Conference in Barcelona, Connecting Our World workshop (see below for links). The workshop presentation is available here. The workshop Connecting With Our World formed part of the 'Making the Web Ph ysical' track at Mozilla Festival 2013 in London (#mozfest) and again at the Mozilla Festival 2014 in London. 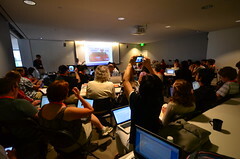 Further worksheets were developed for Scratch 2014 Conference at MIT, Sensing Me workshop. Science focused worksheets have been developed for the Serious Science with Silly Sensors workshop at Scratch 2015 Conference in Amsterdam. The sensor boards provide a means of challenging the notion that computer interfaces are only keyboards and monitors. Young people are already familiar with other interfaces for example to mobile phones and game consoles. Being able to explore alternative inputs to a computer via the scratch sensor boards and develop applications opens new avenues well within the reach of young people. It also poses other questions, for example, how can we improve the sensors, are they reliable over time? How and why do they fail? How can we build better ones? Exploring why things fail or don’t work is often a key to deeper learning and further development. Marie Low, Graduate, Maths & Music, Royal Holloway, University of London. Connecting With Our World workshop was presented at Mozilla Festival 2013 (#mozfest) by the Connecting Our World team (above) and Matthew Healey (3rd year MPhys, Physics, University of Warwick). Marie Low, 2nd year BA Maths & Music, Royal Holloway, University of London. 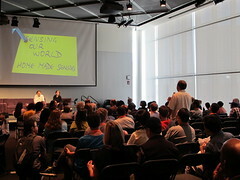 People who were at the Scratch@MIT 2012 workshop and wrote about it. Additional resources that are highly recommended! Some photographs of the Sensing Our World workshop activities from the Scratch 2012 Conference are below. Computing At School (CAS) Hub Leaders weekend, Warwick University 8th-9th February 2013. National HESTEM Conference, Birmingham University, 4th - 6th September, 2012. Computing At School 2012 Conference, Birmingham University, 14th - 15th July 2012. HE STEM Engineering and Outreach Focus Day, University of Swansea, 10th May 2012.